4 x 4 Offroad Racing is a fun offroad racing game in which you must avoid obstacles and repair your car in your race for the finish line. The ability to choose accessories for your car, e.g. tires and gas tanks, makes the game highly replayable. The variety of tracks, from the blistering desert of Death Valley to the snow-covered tracks of Michigan, makes up for their limited number. 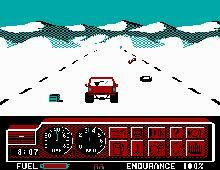 Overall, a fun game with excellent graphics for its time (the animation of toppling-over car is particularly amusing to watch).